Over 1,300 Old World Christmas® Ornaments from The Merck Family's Old World Christmas Blown Glass Ornaments collection. Each is hand-painted with fine details. For New release 2019 and Retired - Clearance - see the BOTTOM OF THIS PAGE. We are an authorized retailer for Merck Family's Old World Christmas (OWC). We carry 99% of their current ornament designs plus over 100 retired ornaments. Old World Christmas has been creating these lovely blown glass ornaments and tree toppers since 1979. Tim & Beth Merck started the company out of their shared love for Christmas with a goal to bring childhood magic and fun to your tree. Their designers are highly artistic men and women who specialize in creating detailed molds for blown glass ornaments. Each ornament is created using the same techniques used in the 1800's by blowing molten glass into these finely crafted molds, then a hot solution of liquid silver is poured inside. The ornaments then go through a labor-intensive process of being hand-painted and hand-glittered layer upon layer until all the details are completed. Old World Christmas sets a very high standard for craftsmanship and details. We are very proud to carry their brand name in our store. 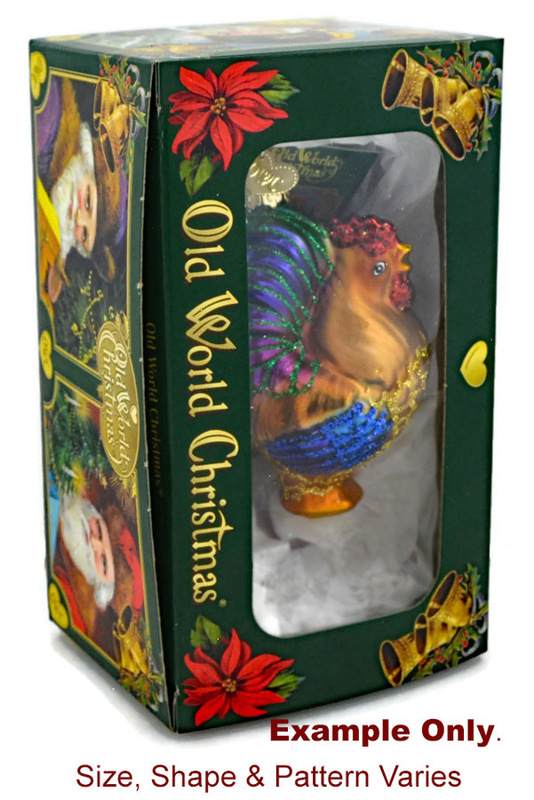 ** Free Old World Christmas Gift Box with every OWC ornament priced $5.99 or more. EXCLUSIONS: Applies to individual ornaments only, not multi-ornament sets. Some are too large for the 6" gift box, they will ship in a WHITE gift box. We have tried to note as many of those as possible on the item details under size/packaging.